On this day in 1959, the renowned family of Late Alhaji Akeeb Alagbe and Alhaja Amudalat Jadesola Sunmonu of Oyo town was graciously blessed with the birth of Monsurat Aduke Olajumoke. She is an illustrious Oyo native and importantly of a royal family. Her educational pursuits began at Children’s Boarding School, Oshogbo for the elementary while the secondary education was at Ilora Grammar School and climaxed at Olivet Baptist High School, Oyo. She had her “A” levels at Kwara State College of Education before LL.B at Holborn Law Tutors and London School of Accountancy with the certification as Chartered Secretary and Administrator. Monsurat Sunmonu also later attended Lewisham College in furtherance of her educational seeking in Management Studies. Prior to her employment in United Kingdom, she had a short spell at Accounts Department of the Oyo State Property Development, now Housing Corporation, Bodija, Ibadan. Upon completion of her routine of advanced studies, she briefly worked with the National Westminster Bank (NatWest Bank) before getting employed by the British Government in United Kingdom Boarder Agency(UKBA) as a Detained Case Manager. The rank she held for over 20years with various capacity trainings and was amongst the first set of Nigerians to be accorded a “Higher Security Clearance” by the British Government. 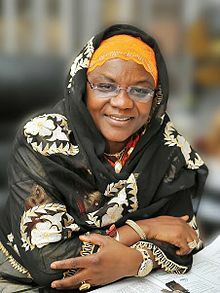 She forayed in murky politics on her return to Nigeria in 2011 under the tutelage of Late Former Governor Lamidi Onaolapo Adesina with an aspiration to contest Oyo Federal Constituency when the progressives political blocks in the defunct Action Congress of Nigeria, ACN were realigning to oust the conservative reign of the Peoples’ Democratic Party, PDP in the state. 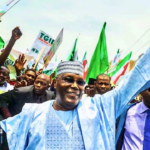 Ultimately, Sunmonu got the nod of the leadership of the ACN to fly the flag of the party for a seat in State Assembly to represent Oyo East and West in the 2011 transition. She got elected and subsequently as the first female chairman, Speaker of the oldest legislative chambers in Nigeria, 7th Oyo State Assembly at the inauguration of the dispensation on the 10th June, 2011. Her speakership unequivocally was widely adjudged as the best since 2003 when there have been all sort of legislative rascalities which have debased the state values in the comity of state with unconstitutionality and hooliganism by so called honourable legislators. Sunmonu presided the crisis free 7th Oyo Assembly with passage of hundred enabling bills, resolutions and people oriented intervention programmes in sync with the executive arm marshalled by Governor Isiaka Ajimobi in his first term in office. While chairing Oyo Assembly, she was also elected as Deputy Chairman of Conference of Speakers of the Federal Republic of Nigeria which has 36 Speakers of each state of the federation. In the twilight of her electoral debut as member; Speaker of the Oyo State House of Assembly, she contested and won the national assembly ticket of the All Progressives Congress, APC to represent Oyo Central senatorial district in a keenly contested primaries. Sunmonu was historically elected as first female senator to ever emerge from the state for the upper representation of the people of Oluyole, Ona-Ara, Akinyele, Egbeda, Atiba, Oyo East, Oyo West, Afijio, Surulere, and Surulere local government areas in the red chamber. In the scheme of the outgoing 8th National Assembly, she is saddled with series of national tasks in making good of the myriad of the All Progressives Congress, APC led President Mohammed Buhari among which are the chairmanship Senate Committee on Foreign Affairs, membership of Senate Services and Constitutional Review. At home front, she is a definition of many human and communal developments with social and economic inputs across her constituency and beyond in the state as former third in charge of the state affairs, Speaker and Senator of the Federal Republic of Nigeria through her privileged good offices and a charity organization in her name, The Monsurat Olajumoke Sunmonu World Empowerment Foundation(MOSWEF). She is a rallying point in the present tricky Oyo State politics due to her astuteness and magnanimity as teeming protégés of Lam Adesina Political and Leadership popularly called Lamists under the auspice of the Unity Forum across the 33 local government areas of the state fortnight ago unanimously ordained her as their Leader.